Fall… is there another season more refreshing, more colorful, more reminiscent of God’s bounty and goodness? I’m sitting in my hammock on the patio with my young son beside me “reading” a book. The air is cool, you can feel the moisture of an impending rain. A soft breeze just wisped by, knocking a few leaves off my neighbors trees. Earlier I heard a gaggle of geese flying over head in their iconic V, making their way south. Since all the children are in school, chirping bugs and breezes rustling through the trees are just about the only sounds I can hear this calm morning. My refrigerator has a bounty of tomatoes from my garden. Over the weekend I loaded up my kitchen table with mini gourds (for 50c a piece! 😊). My fall decor is starting to come together, giving my house a warm, festive feel. It truly is a great season! I didn’t want a bunch of matching pillows, because I’m weird like that. Some I knew exactly what I wanted them to look like and how I wanted to make them. 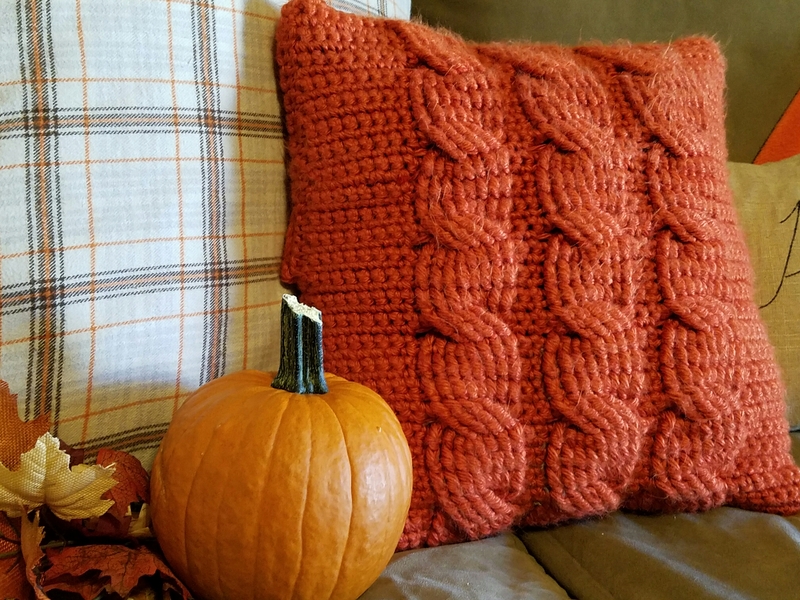 Others I had an idea what I wanted but not specifics (like my crochet throw pillow…I knew I wanted one, but didn’t have a set pattern in mind). I also wanted at least one that was not so basic to kind of serve as an interest piece. So, to Pinterest I went in search of diy pillow covers. 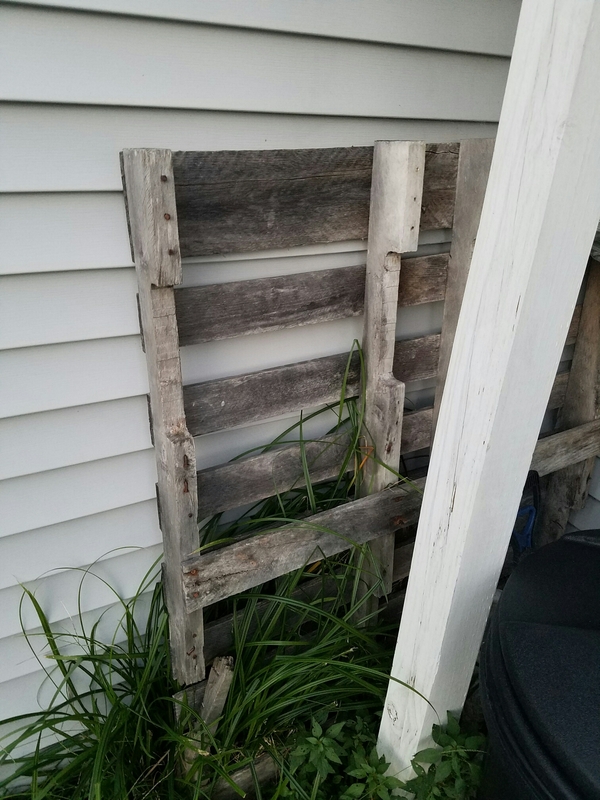 I fell in love with these, and they were so cheap and easy! Perfect for my statement pieces. 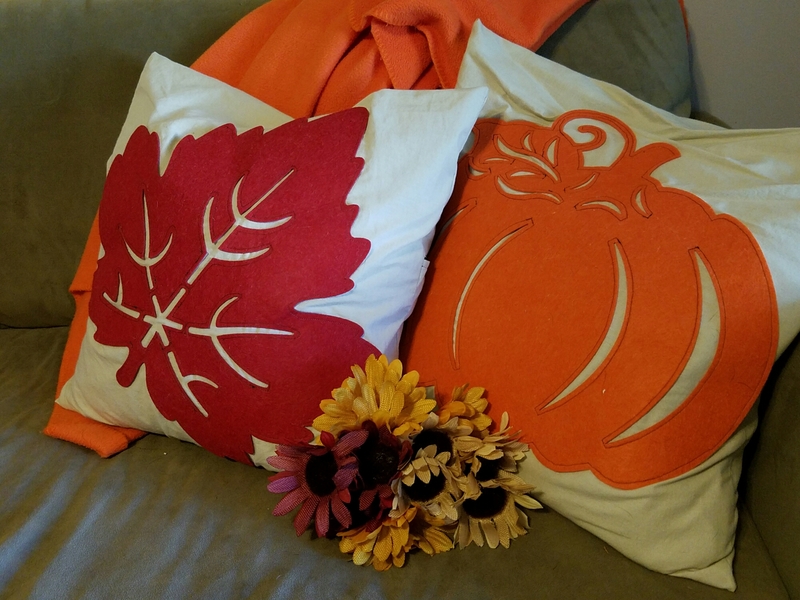 Simple dollar store felt cutouts sewn on a solid pillow cover. 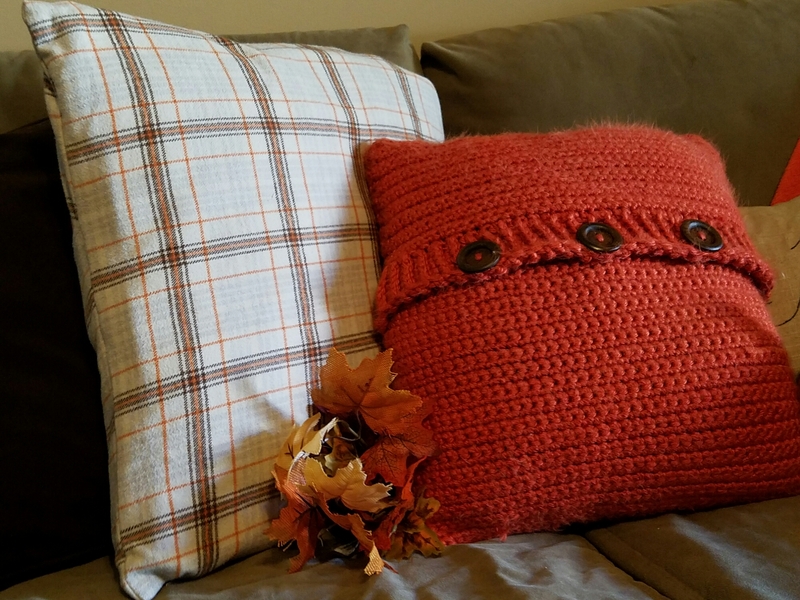 (Here is my super easy envelop pillow cover tutorial.) I think I spent less than $4 for both of them! The only problem was deciding which shapes to use… which is when I make my husband choose. 😊 Except now I have this adorable owl and don’t know what to use him for. I’m open to ideas! 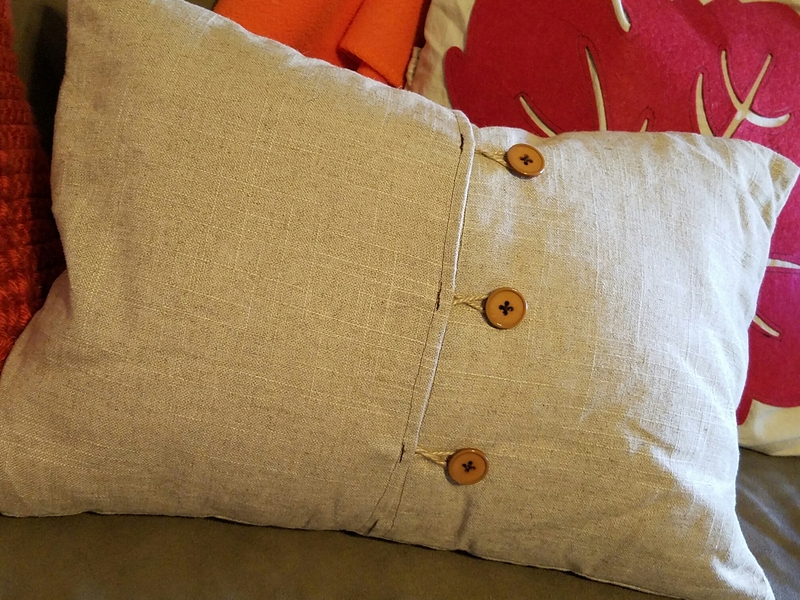 I also like having a little something special on the back of the pillows for those times when they get thrown around and aren’t facing out, so I put some buttons with a twine loop fastener on the back to bring in some more “natural” feel. So there you have it! 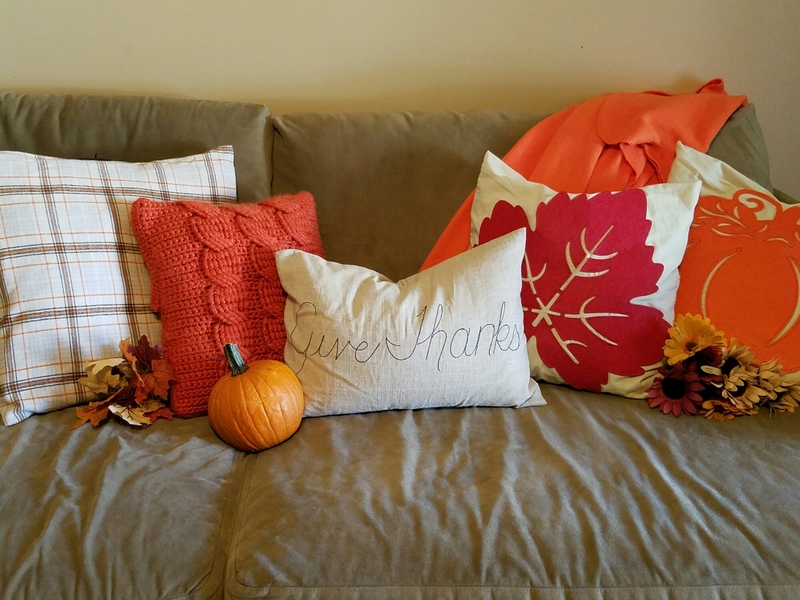 My beautiful, simple way to bring a ton of fall color into my living room for relatively cheap! But don’t worry… there’s more in store! Here’s a sneak peek at the upcoming Handyman Husband project! What could it be? Share your guesses in the comments! Also, how do you decorate for fall? 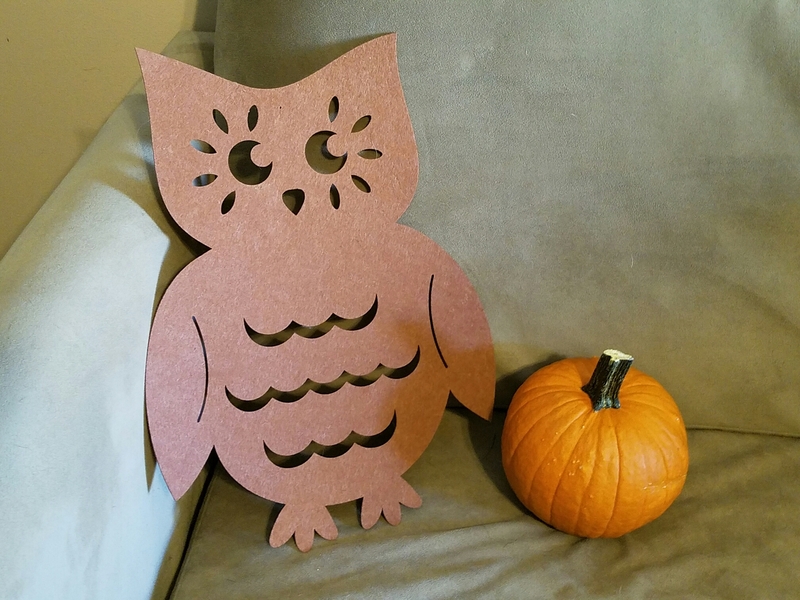 Share your favorite fall decor or craft ideas. I’d love to hear from you!